This project is aimed at innovating in multiple fronts of multiobjective optimization (MO) from the perspective of metaheuristic techniques. For this purpose, we will achieve a relatively ambitious set of contributions at the end of the project. First, we plan to advance in fundamental research by developing new multiobjective models for algorithms such as ant colony, scatter search, cellular genetic algorithms, particle swarm, differential evolution and other procedures capable of solving problems of realistic dimension and complexity. Second, the problems tackled will not be limited to typical instances drawn from standard benchmarks, but instead we will also select problems from four hot domains in a coordinated manner to perform an applied research: software engineering, economy, communications and traditional engineering. This way, the benefits will lie in both methodology and real applications. 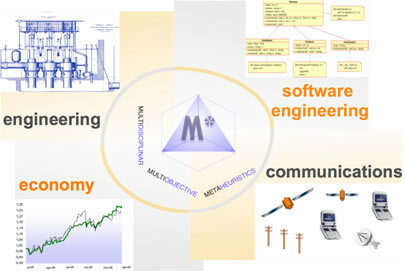 The goal is to unify criteria for experimentation and evaluation of new MO techniques, and to improve their efficiency and effectivity with respect to the present state of the art in the metioned domains; we aim at showing that the contributed techniques are not only appealing in theory, but also effective and useful for society. To this, our methodology will include the study of where and when a multiobjective formulation is advantageous compared versus a monoobjective one, as well as the scalability of the techniques developped. We want to advance in the use of new technologies and research lines that are presently hot topics at an international level, but from a multiobjective perspective in our case. For this purpose, we will design MO algorithms that will use parallelism and grid computing on complex problems, and study combinations with other techniques (hybridization) using also problem-aware operations. The studies about grid computing, hybridization, and a long list of new algorithmic extensions in a unified way inside one project, are only possible thanks to the coordinated work of four teams of researchers. In the same manner, the transfer of this new MO knowledge to the four selected domains is only possible in a joint manner, actually enabling the project to spread the advances to multiple research niches (informatics, operations research, algorithmics, specialists and applications…), thus increasing the international impact. This project has foreseeable transfers to industry (i.e., EPOs) and focuses on multidisciplinar advances from a common coordinated point of view in applications of social interest and in Computer Science (TIN). The proposal is expected to endorse a Spanish effort visible in multiobjective research during the next three years, improving the state of the art of this field in our country. We will tackle therefore a mission for internationalization of the results, with frequent visits to foreign teams, high impact publications, research staff training, and also directly involving world-class foreign researchers of the MO field in the project to take part in our project: doctors Coello, Zitler, Fonseca, and Deb.